You are here: Home / Google Algorithm / How to Survive Google EMD (Exact Match Domain) Penalty? Its not more than a week ago when Google launches a brand new algorithm update in which they are going to penalize low quality exact match domains (EMD penalty) from their Search Results. 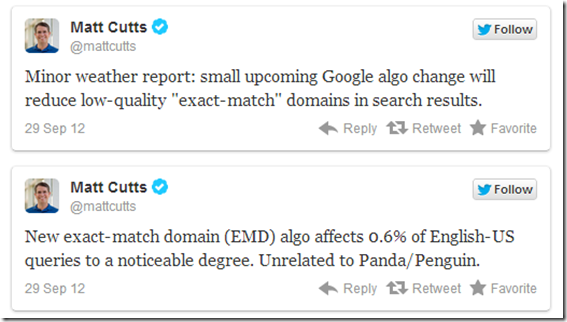 Recently Google’s head of web spam department Matt Cutts tweeted that they have rolled out this update which was neither Panda nor Penguin. According to the early reports, “the EMD Penalty” already affects 0.6% of English-US queries. Many Webmasters who are into micro niche blogging, for them exact match domain penalty seems like one of the worse update ever. Therefore today I am going to tell you that How to Recover from this EMD Penalty if your site/blog get penalized in very bad way from SERPS. How to Recover from this Google Exact Match Domain Penalty? 1. From Now don’t ever think of gaining high ranking in search results by picking up great keywords matching domains name. For ex- makemoneyonline.com etc. 2. Your Site/Blog Quality Content Matters: Make sure that you build highly professional content to keep your selves away from any kind of algorithm refreshment. Avoid thin, low and Copycatted Content to your site. 3. Build a New SEO Strategy: Once you got penalized by this penalty, now its time to rethink about everything. Now avoid every low-class and old SEO tactics to bring back the old domains. Start from the Blog title to its nature of business. You have to drop or modify few things, but these changes will bring back the organic traffic to your website. 4. Update old Blog posts: Again its time to update your old blog posts with new much more optimized and improved keywords to obtain high rankings in all search results. 4) Now login to your Google Webmaster Tools and find option to move site to other domain. Although this update is very good for Probloggers and us who is truly dedicated to quality blogging. On the other side, this penalty is a hard slap on those webmasters faces who just concentrate on buying good domain names not its content. But If this much rate of Google Algo. comes one after another then I must take guarantee that in coming time there will be no more spam in Google Search results. Peace and Blessings. – Have you seen any traffic change or update after this new domain level penalty rolled out? If Yes, then please share your experience below.